Thursday morning, students in Saint Louis University (SLU)’s “Rainbow Alliance” sent an email detailing their plans to organize a walkout protest of Allen West’s YAF-sponsored lecture scheduled to take place on campus at 7:00 p.m. CST. Protesters plan to wear matching white shirts, take up “as many seats in the auditorium as possible,” and stand up row by row to leave as soon as Lt. Col. West is introduced. The entire email is worth a read for the comedic value alone. If these students think YAF and Lt. Col. West can’t handle a little walkout protest, they’re sorely mistaken. Lt. Col. Allen West will address SLU tonight at 7:00 p.m. CST as part of YAF’s Fred Allen Lecture Series. With the events going on tonight regarding Allen West, Rainbow Eboard wanted to inform all of our members about a protest Muslim Student Association (MSA) is putting on in response. If you are available tonight to come and show solidarity and support MSA it would be greatly appreciated. The hate speech Allen West is saying should not be tolerated at our campus, and we want to show SLU that we are not okay with West’s presence here. 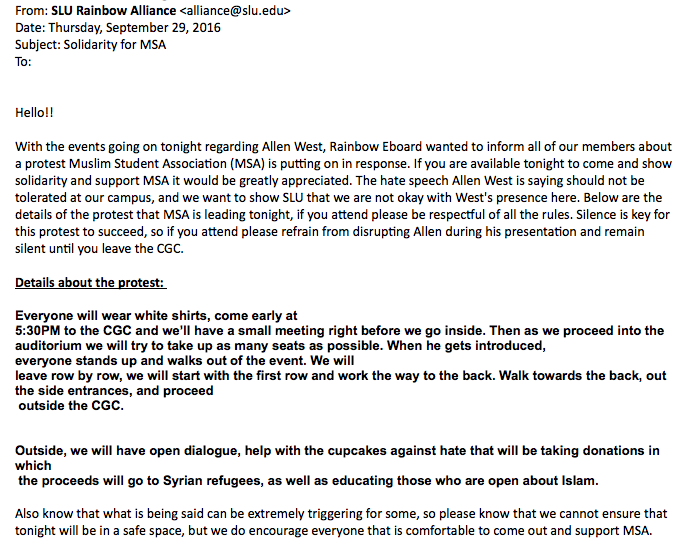 Below are the details of the protest that MSA is leading tonight, if you attend please be respectful of all the rules. Silence is key for this protest to succeed, so if you attend please refrain from disrupting Allen during his presentation and remain silent until you leave the CGC. Everyone will wear white shirts, come early at 5:30PM to the CGC and we’ll have a small meeting right before we go inside. Then as we proceed into the auditorium we will try to take up as many seats as possible. When he gets introduced, everyone stands up and walks out of the event. We will leave row by row, we will start with the first row and work the way to the back. Walk towards the back, out the side entrances, and proceed outside the CGC. Outside, we will have open dialogue, help with the cupcakes against hate that will be taking donations in which the proceeds will go to Syrian refugees, as well as educating those who are open about Islam. Also know that what is being said can be extremely triggering for some, so please know that we cannot ensure that tonight will be in a safe space, but we do encourage everyone that is comfortable to come out and support MSA. Also we are attaching a statement that MSA has released in regards to the Allen West event. Please spread their statement around and bring awareness of their views. The Muslim Students’ Association at Saint Louis University condemns these statements made by this individual. These allegations, which align the Muslim Students’ Association with terrorist organizations, have no basis. Saint Louis University prides itself on its devotion to civility, diversity, and social justice. At the same time, the university should be a place for higher intellectual discourse among individuals of different beliefs. We, the Muslim Students’ Association, know and value the space and ability to have difficult conversations on a college campus. Civility is the prerequisite for engaging in difficult conversations and is a hallmark of the SLU community. However, by spreading offensive remarks against the Muslim Students’ Association, the speaker has chosen to move outside of the boundaries of civility and inclusivity. The false comments that this individual made on September 22, 2016 are being used to incite fear in the SLU community. In the current climate where Islamophobia is manifesting through violence against Muslims, this kind of rhetoric is not only offensive but dangerous, as evidenced through a number of burnings of mosques and attacks on individual Muslims following comments such as these. The Muslim Students’ Association is involved in constructive dialogue concerning current events, actively developing relationships with other religious groups, and other activities which make it a vital part of the SLU community. The Muslim students on campus are involved in service, community outreach, and inter-religious dialogue. We are students that are trying to balance the pressure of college with the current political climate, and comments such as these are deeply hurtful. With our ongoing commitment to the university’s ideals as well as the Oath of Inclusion, we ask the entire SLU community to help support us in our cause to help spread the true meaning of Islam and to create a stronger and safer community at Saint Louis University. And we believe that this individual’s presence does not reflect the commitment to civility and inclusiveness that Saint Louis University espouses. Also if anyone is feeling uncomfortable or in need of someone to talk to today feel free to contact anyone on Eboard, we are here for you. Also utilize the Rainbow/Una office, BSC 127, as a safe space if you need to today or any day in the future.